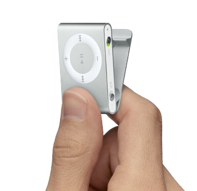 A friend handed me the new iPod shuffle today, and, as if hypnotized, I clipped it onto my sweater like a pin. One gigabyte of music or data! I want one, plus a coordinated pair of wireless "speaker" earrings.